Want to know about updates and announcements, this is the right place. Check out what our Music Education Designer for Ukulele and Bass has to say about the different ukulele versions available in Yousician here! Check out what our Music Education Designer for Guitar has to say about the different guitar versions available in Yousician here! Please note that some songs are not available for every instrument and territory limitations may apply. We value your requests on our Song Requests Forum so if you can’t find your favorite song in Yousician, make sure to request it there! More changes are coming to our piano users: with this update, practice and perform modes will be using the same background color. This should further improve the finger colors visibility. We’re continuing to work on the standard notation mode and with this update we improved sheet music spacing to use rhythmic spacing instead of proportional spacing. The leaderboards, as well as some other screens, are now optimized for iPhone X. Several fixes were made for tuplets and triplets in standard notation for piano. 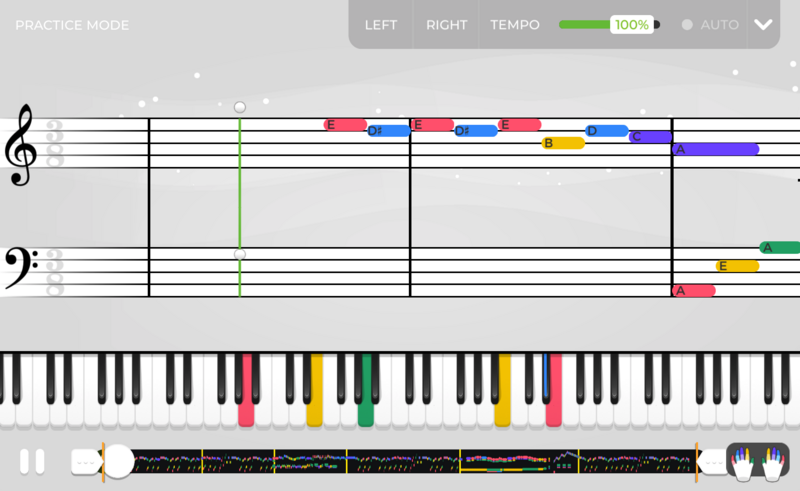 Exercise type will now be shown for the songs in the Guided Lesson. The update will be available for PC and Mac on Monday, April 1st, and for Android and iOS a few days later. We hope you will enjoy the new songs and improvements. Thanks! In my feedback post I mentioned how annoying the changes in scrolling speed are in sections with a lot of 16th notes. I'm glad you changed this. I appreciate the change in sheet music spacing. However I can’t read the black note font on the dark note colors. The space between note and sharp or flat sign is also very narrow and confusing with the bold font. Could you make a dark / light mode? Your developers must be colorblind. You’ve increasingly made it more difficult to read. Last time you switched to pastel colors with white labels (low contrast). Now it’s dark colors with black labels? Black on dark purple? All on a light grey background that floods your eyes with light and makes it difficult to pick up the small things. I guess this is incentive to learn standard notation! If you want to see how to do it right, look at Rocksmith... please! I love Yousician but you are forcing me to find alternatives because you can’t seem to get the graphics to not hurt my eyeballs. Also, you went the wrong way... should have used the dark blue background from practice mode consistently! Completely agree with the posters above - it's very hard to actually read the notes on purple and blue now. Please revert this back - wrote to support as well. Sized to same as my phone - very hard to see notes with black writing on purple background, especially flats and sharps. Your new system just drive me crazy and I'm not able to play any song now! Until now I was really learning, now the speed of the ball just goes from fast to slow and I can't understand why. Please add an option for your user (at least the premium…) to choose between the old and new system! Agreed with all others - the color scheme is tolerable on a tablet, but, on a phone, purple (middle finger) bars are completely unreadable. It was much better back when you had white letters. And the sharp symbol seems to have gotten smaller, which makes things even worse. Also, the correct note counter does not get enabled when you switch into practice mode. It only appears after you hit "restart". Otherwise, you can play the tune front-to-back several times without ever seeing the counter. ps: in the practice mode, the new round starts immediately, at the beginning there's no spacing (gap) to see or get prepared to the next notes. Only by pressing "restart", the gap appears. What happened to Al Green Let's stay together?